This page is for all autoharp lovers, pickers and grinners, and is brought to you by Lindsay Haisley, FMP Computer Services and the Cyberpluckers autoharp community. It may help you stay up-to-date on autoharp news and help you connect with players, performers, luthiers and other resources for the instrument. Fladmark Autoharp Strings, the gold standard in autoharp strings, widely available from luthiers and autoharp supplies retailers, has a new name. 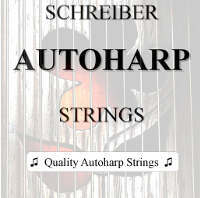 Master autoharp luthier Tom Fladmark has passed the string-making baton to fellw master autoharp luthier Greg Schreiber, and going forward these strings will be sold as Schreiber Autoharp Strings - new name, same unmatched quality you've come to expect. If you know of an autoharp resource that should be listed on this page, please contact Lindsay at fmouse@fmp.com. Links on this page are free, and are published here at my discretion, usually these days at the request of the linkee. We found this excellent video by Tom Fladmark and Greg Schreiber that tells how the cow eats the cabbages when it comes to string changing! The Cyberpluckers is a collection of autoharp players and autoharp music lovers who work and play (when they're not playing music) on the Internet. The Cyberpluckers keep in touch by means of an electronic mailing list. You can join the discussion by subscribing to the list and participating. According to a number of authoritative and reputable sources, Ron Wall is currently the reigning King of the Autoharp. This coronation was by unanimous decision of the Autoharp Board of Authorities, duly convened and in official session on April 18, 2019. The former reigning sovereign, Les Zook, graciously abdicated to allow the honor to be shared and appreciated by a larger audience.